material made by pulverizing the ground, dried residue of corn grains after preparatory soaking and the removal of the embryo and the outer covering. It is used as laundry starch, in sizing paper, in making adhesives, and in cooking. ..... Click the link for more information. ; various modifications of this test are used to detect glucose in urine, which may be a symptom of diabetes. 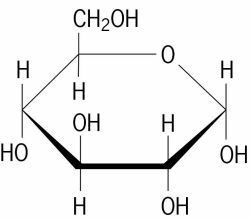 A monosaccharide also known as d -glucose, d -glucopyranose, grape sugar, corn sugar, dextrose, and cerelose. The structure of glucose is shown in the illustration. Glucose in free or combined form is not only the most common of the sugars but is probably the most abundant organic compound in nature. It occurs in free state in practically all higher plants. It is found in considerable concentrations in grapes, figs, and other sweet fruits and in honey. In lesser concentrations, it occurs in the animal body fluids, for example, in blood and lymph. Urine of diabetic patents usually contains 3–5%. d -Glucose is the principal carbohydrate metabolite in animal nutrition; it is utilized by the tissues, and it is absorbed from the alimentary tract in greater amounts than any other monosaccharide. Glucose could serve satisfactorily in meeting at least 50% of the entire energy needs of humans and various animals. Glucose enters the bloodstream by absorption from the small intestine. It is carried via the portal vein to the liver, where part is stored as glycogen, the remainder reentering the circulatory system. Another site of glycogen storage is muscle tissue. (grape sugar, dextrose), the carbohydrate most frequently found in nature; it belongs to the hexoses, that is, to monosaccharides containing six carbon atoms. Its crystals are colorless, and its melting point is 146.5° C. It is highly soluble in water. Glucose solutions contain molecules in the α- and β- forms; equilibrium is attained at 37 percent and 63 percent, respectively, of these forms. Glucose is optically active, bending a beam of polarized light to the right. Glucose of the α-form is an essential component of all living organisms, from viruses to higher plants and vertebrates (including man). It is a component of various compounds, ranging from saccharose, cellulose, and starch to some glycoproteins and viral ribonucleic acid. For a number of bacteria, glucose is the only source of energy. Glucose participates in many metabolic reactions. The glucose content of human blood is about 100 mg percent, and it is regulated by the neurohumoral mechanism. A lowering of the glucose content to 40 mg percent leads to a sharp disturbance of the activity of the central nervous system. The basic means of glucose utilization in the organism are anaerobic transformations, accompanied by the ATP synthesis and terminating in the formation of lactic acid; glycogen synthesis; aerobic oxidation to gluconic acid in the presence of glucoseoxydase, a process occurring in some microorganisms that utilize it to produce energy and accompanied by oxygen absorption from the air; and the conversion of glucose to pentoses and other simple sugars. The complete enzymatic oxidation of glucose to CO2 and H2O is accompanied by the release of energy: C6H12O6 + 602—6CO2 + 6H2O + 686 kilocalories per mole. Most of this energy is accumulated by high-energy compounds of the ATP type. The synthesis of glucose from inorganic components is the reverse process, carried out by plants and some bacteria using the energy of sunlight (photosynthesis) and the energy of chemical oxidation reactions (chemosynthesis). Glucose is produced industrially by starch hydrolysis. It is used in the pastry industry and medically as a drug. Glucose is used for medical purposes in powder and tablet form, as well as in isotonic (4.5-5 percent) and hypertonic (10-40 percent) glucose solutions. Isotonic solutions are administered (subcutaneously and in enemas) for replacing fluid in the organism. These solutions are also a source of readily assimilable nutrients. Introduction of hypertonic solutions (intravenously) leads to an increase in the osmotic pressure of the blood, improves the metabolic processes, strengthens the antitoxic function of the liver and the contractive activity of the heart muscles, dilates the blood vessels, and increases the elimination of urine. Glucose solutions are used to treat infectious diseases, heart ailments, various intoxications, and other conditions, frequently in combination with ascorbic acid. C6H12O6 A monosaccharide; occurs free or combined and is the most common sugar. Also known as cerelose;D-glucopyranose. 2. a yellowish syrup (or, after desiccation, a solid) containing dextrose, maltose, and dextrin, obtained by incomplete hydrolysis of starch: used in confectionery, fermentation, etc.